Here at Bronhaul, we grow a wide variety of fresh and healthy fruit and vegetables, working with nature. We love to produce food for ourselves and our guests, but this year we started offering ‘Share in the Harvest’ veg boxes to local people and local cafes and restaurants as part of the ‘Glasbren‘ project. Over around half an acre, we grow around 30 varieties of fruit and vegetables in a way that improves, rather than depletes the soil, that grows biodiversity as well as a source of food, and allows us to live and eat in harmony with the natural world around us. We want to develop a model of how small-scale farms, closely linked to their communities, can provide a solution to our current crises of food and the environment. So what does it mean when we say we are ‘growing with nature’? As a foundation to all of our food growing is rich, healthy soil, teaming with worms, microbacteria and fungi. We produce as much of our own compost as we can, carefully turning kitchen waste & organic matter – grass cuttings, accelerators like comfrey and nettle, fallen leaves, woodchip from our sustainably grown willow and alder and manure from our farm animals – into balanced, nutritious soil for our plants and trees to grow in. There’s quite a science to it! 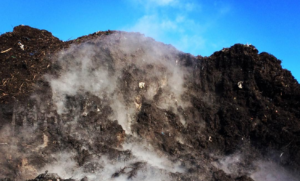 What we can’t make, we get from the Compost Mountain at CWM Environmental, who turn Carmarthenshire’s food waste and green materials into steaming black gold for our market garden. There is not a chemical fertiliser in sight at Bronhaul. 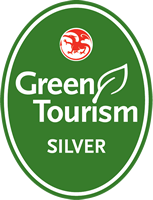 We produce all of our own fertilisers in the garden using materials from the farm. We harvest Comfrey – an impressive plant that can mine trace nutrients from deep in the subsoil, and make them available in its leaves – and soak it to make a Comfrey Tea to give our young seedlings a head start. We soak chicken poo in water, dilute the ferment and use that, too, to give a helping plant to our vegetables through the season. In nature, there’s no such thing as a monoculture. Plants grow together in harmony, forging beneficial relationships to help them grow strong and resilient as part of plant communities. We try to mimic this pattern as much as we can in the garden. We try to maximise space by intercropping our vegetables, growing plants of different heights, root depths, appetites and shade tolerance close together – like getting in a quick crop of lettuce in between our leeks as they grow slowly, for example, or spinach in the shade of our cabbage plants.This helps us to produce as much food as we can on as little space as possible, but also provides complete ground cover for the soil, holding the moisture in and protecting it from erosion. Nature hates bare soil. We also grow plants in companionship to help reduce pests, attract beneficial insects to the garden and increase the nutrients that are available to our plants. 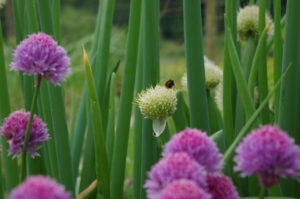 Alliums like chives, onions and our beautiful perennial welsh onions help keep things like carrots free from pests. We protect our cabbages from cabbage white butterflies (and their destructive spawn!) by growing nasturtium, a peppery edible weed, nearby to distract them. We grow lots of Calendula, Borage and Cornflower near to our pumpkin, bean, squash and tomato plants (as well as many others) to attract the pollinators we need to get plenty of fruits. Plus, the bees need a little help at the moment. Want to know more about how we grow our plants in relationship? Look out for my ‘Growing with Nature’ series, where I’ll go into each element in more detail. We grow all of our vegetables from seed. Sowing them in the dark depths of late winter, each seed holds the promise of a harvest months later. We use only organic seed, sourced from small-scale British seed growers like The Seed Cooperative and The Real Seed Catalogue, based in Pembrokeshire. All of the seed we use is also open-pollinated – which means it’s pollinated naturally, by the wind and the careful work of bees and other insects – unlike alot of seed which is artificially pollinated in a lab. 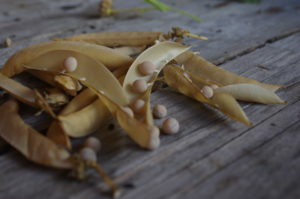 More and more each year, we also save our own seed, storing up a bank for growing in the future. Growing food with nature can’t ignore a fundamental component – our human nature. Growing with nature must consider the way we, the growers, interact with the wider garden ecosystem. We carry out almost all of the work in the garden by hand, using hand tools, with our fingers and toes in the soil. This means that our own inner microbiology aligns itself with the microbioology in the soil. It means we are connected to the soil life that grows our food and attuned to seasonal changes. And it is an endless source of wonder and physical and mental wellbeing. Mimicking nature we work together, in harmony, which makes us stronger, more resilient and able to get through the hard times to enjoy the bounty of harvest, together. Our naturally-grown fruit and veg is available to buy from the garden Hub, and also in weekly ‘Share in the Harvest’ veg boxes as part of Glasbren‘s CSA scheme. Live between the rivers Taf & Tywi? 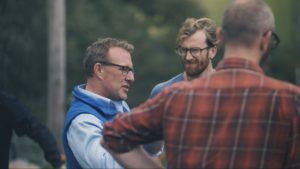 Join Glasbren and support local food for local people, grown with nature. Get in touch to find out more, come and visit us at the garden or pre-order your veg before you arrive.